Handling Tips: 45�F. Keep dry. 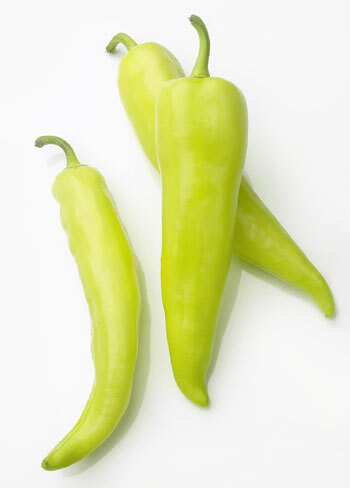 General Information: Sweet banana peppers are popular garden-variety peppers. The banana pepper is a very productive plant producing banana-shaped fruits that change from pale to deep yellow or orange as they mature. These benign members of the Capsicum family have a crisp, juicy texture and a mild flavor that bears little resemblance to that of their mouth-searing cousins, the chiles. Peppers are native to the tropics and were introduced in Europe by Christopher Columbus. Peppers quickly took on starring roles in a variety of Spanish dishes and are now used in cultures throughout the world. Sweet and mild in flavor, this variety of pepper resembles the Hungarian Wax pepper which is often considered to be the same chile pepper except slightly larger and hotter in flavor. Applications: Banana Peppers can be served in salads, salsas, sauces, soups, stews, sandwiches, and as appetizers either fresh or pickled. Wash peppers just before using; remove the stem, seeds, and interior membranes, and add to salads, soups, or stir-frys. Peppers can be saut�ed, steamed, or baked. Roast peppers by holding them over an open flame, or broiling them about 1/2-inch (1.25cm) from the broiler flame and rotating every minute or so until they blacken evenly. Put charred peppers in a plastic bag for about 10 minutes, then pull off the blackened peels and rinse the peppers under cold water. Pat dry, remove seeds and stems, and slice peppers. Use roasted pepper slices in salads, or pur�e in soups.